‘Entrancing fare, Paul Draper’s work has taken on a new edge with the passing of time, culminating in his new solo record‘. 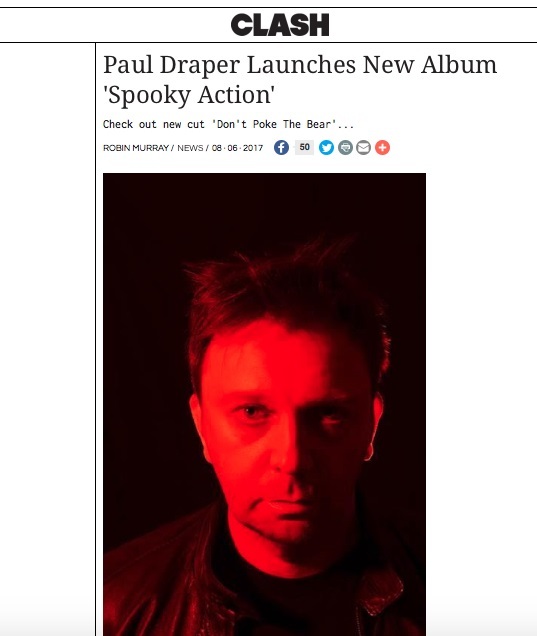 ‘Spooky Action’ will be released on the 11th August but is available to pre-order NOW from the Official Paul Draper Store HERE . It is available as Deluxe 3CD Book, a limited edition 2 LP heavyweight white vinyl or a 2 LP black vinyl , all of which come with a limited edition signed art print. It is also available as a cd digipak and as a download. All format’s come with a free immediate download of the opening track, ‘Don’t Poke The Bear’. You can read the full article, and listen to ‘Don’t Poke The Bear’, on the Clash website HERE .